A properly designed audio system can mean the difference between success and failure of a building's design, particularly in performance spaces, theatres, halls and houses of worship. In crowded and noisy areas where speech intelligibility is paramount, or where emergency warnings and evacuation instructions need to be heard, the correct implementation of the public address system can be considered to be as important as smoke alarms, fire extinguishers, or any other piece of safety equipment. To ensure your project meets expectations and complies with relevant legislation, CMI offers a no obligation consultation, design and quoting service which will ensure that your audio system performs to the very highest standard. Furthermore, by utilising CMI's expertise early in the design process common mistakes which lead to poor performance, cost overruns and missed deadlines can be avoided. Each room is different, every building has a different purpose and every client has unique requirements. Using your project's CAD drawings or following a site inspection, CMI can design and implement a system befitting the actual needs of your project, from concert halls where musical reproduction is absolutely critical, to hearing aid induction loops or multi-level concrete car parks where uncontrolled reverberation can render the wrong P.A. system virtually useless. Using speaker manufacturer's prediction software like Adamson's Shooter, and EASE (Enhanced Acoustic Simulation for Engineers) we can predict qualitative acoustical factors such as sound pressure level (SPL), speech transmission index (STI), articulation loss of consonants (ALCONS), frequency distribution and overall coverage of the sound system. During this stage the strengths and weaknesses of the design can be assessed and rectified if necessary. Other critical factors such as mechanical loading and line-of-sight are also considered to ensure that the system works in harmony with the rest of your installation. CMI's mix of audio brands gives us access to a wide range of options when it comes to keeping your project on budget. Whether unrivalled performance or value for money is your priority we can provide you with multiple cost options for every kind of system, from world-class concert rigs right through to announcement and evacuation systems. A great sounding system requires the best components, but also the ears of an experienced system engineer to properly calibrate, tune and test each item in the signal chain. CMI's Pro Audio team have many years of experience in making audio systems sound the way they should. Understanding the construction process is also key to a smooth install. During the installation CMI's staff will work closely with key personnel such as Project Managers, Architects, Acoustic Consultants and Builders to ensure that all facets of the process run smoothly. CMI's Pro Audio sales team consists of qualified, dedicated and experienced people with extensive backgrounds across audio engineering, electronics, system design, touring and installation. Our priority is to understand your individual needs and to ensure that your audio installation suits your needs, expectations and budget. Adamson: Brock Adamson began creating speakers in the mid 1980s and his designs and single-minded dedication to quality has earned the Adamson brand an international reputation for excellence. From their compact point-source enclosures to large scale concert line-array systems, Adamson has become one of the most highly sought after names on touring bands' and festival rider specs the world over. Based in Port Perry, Canada, the Adamson factory was purpose built and all products are handmade to order. HK Audio: HK Audio offers installers, contractors and production houses some of the finest sounding and innovative products on the market. Their research into FIR (Finite Impulse Response) filtering and line-source designs have resulted in several major breakthroughs in sound reproduction technology, embodied by their Cohedra and Contour product lines. Their IP44 rated CADIS range is an ideal solution for outdoor installations where high SPL, intelligibility and durability are paramount. 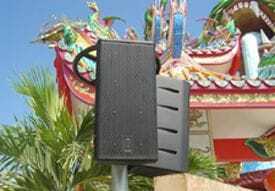 One Systems: One Systems specialise in direct weather loudspeaker applications, and have successfully bridged the gap between truly weatherproof, durable speaker designs and excellent audio quality. This means that realistic, full-bandwidth music and vocal reproduction need not be sacrificed if speaker placement in exposed areas is a concern. All One Systems loudspeakers are designed to IEC529 and are rated to at least IP45. XTA: XTA's range of digital signal processors and loudspeaker management systems are some of the most highly regarded in the Pro Audio industry, and are widely found in the world's most discerning production houses and recording studios. MC2: Probably Britain's most esteemed manufacturer of power amplifiers, MC2's range covers ultra lightweight, high-output touring amplifiers and networked remotely managed systems for permanent installation.